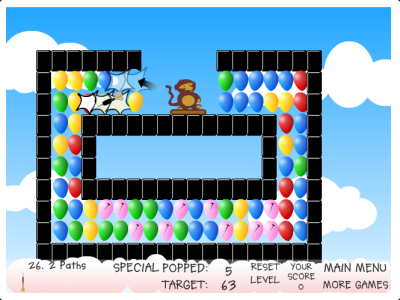 You're controlling a little monkey which must hit and destroy balloons with one or more darts. The trick being to find the right angle and strength to hit a maximum number of balloons with a limited number of darts. An extremely addictive game, coming with numberous and very inventive levels following a progressive difficulty. Many more variations of this game are also available on the author's website, highly recommended as well!